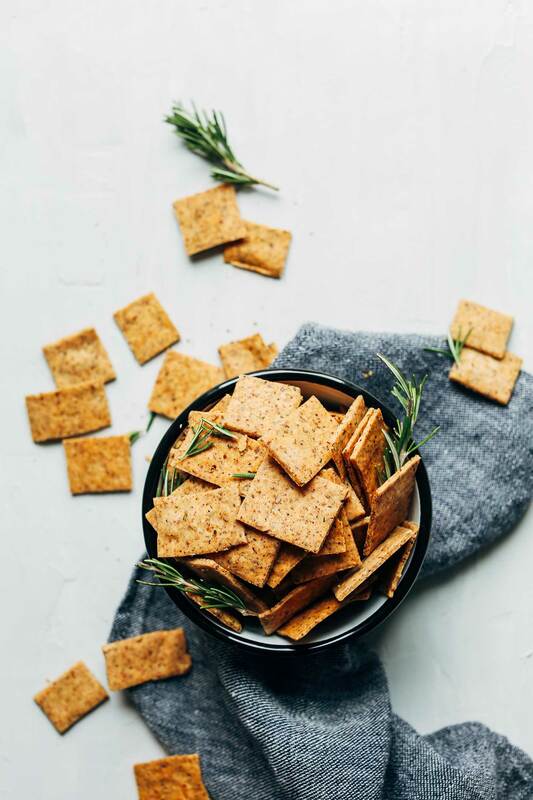 What I’m saying is: These delicious crackers make excellent use of ingredients you likely have in your pantry right now. Shall we? 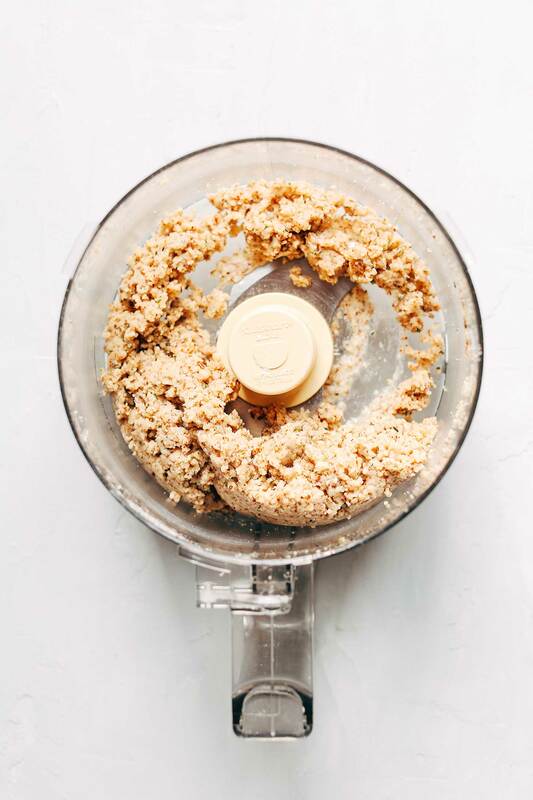 This recipe requiring just a food processor (or bowl!) and 7 ingredients to make. The base is gluten-free flour blend and almond meal, and the flavor comes from salt, garlic powder, and rosemary. You could also add a little nutritional yeast for cheesiness if you’d like (see my Vegan Cheez Its for inspiration). Next comes oil and water to bring moisture to the dough. The fat adds a bit of flakiness, and water brings crispiness. A perfect balance of the two makes these crackers easy to roll out and form as well as spot-on in texture. Once they’re rolled out and sliced, a quick trip to the freezer helps them firm up to make transferring to the baking sheet a breeze. Then just 15-20ish minutes in the oven and BAM! You have homemade crackers on your hands! These would make the perfect snack to have on hand during the week. They would be especially delicious with Hummus, Nut Butter, Vegan Nutella (do it), Lentil Dip, Chickpea Shawarma Dip, Spicy Pimento Cheese Ball, or Smoky Harissa Eggplant Dip. For similar recipes, check out our Vegan Cheez Itz and Cheezy Peanut Butter Crackers! If you try these crackers, let us know! Leave a comment, rate it, and don’t forget to tag a photo #minimalistbaker on Instagram so we can see. Cheers, friends! 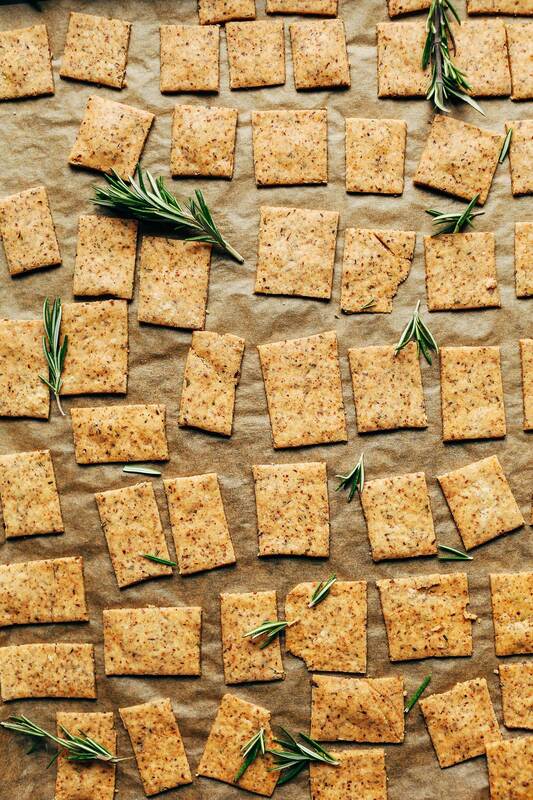 Crispy, thin, gluten-free crackers reminiscent of Wheat Thins! Just 7 ingredients and 1 bowl required for these delicious snacks. Perfect for dipping in hummus, nut butters, and more! Preheat oven to 325 degrees F (165 C) and line 1 large or 2 small baking sheets with parchment paper (adjust number of baking sheets if altering batch size). 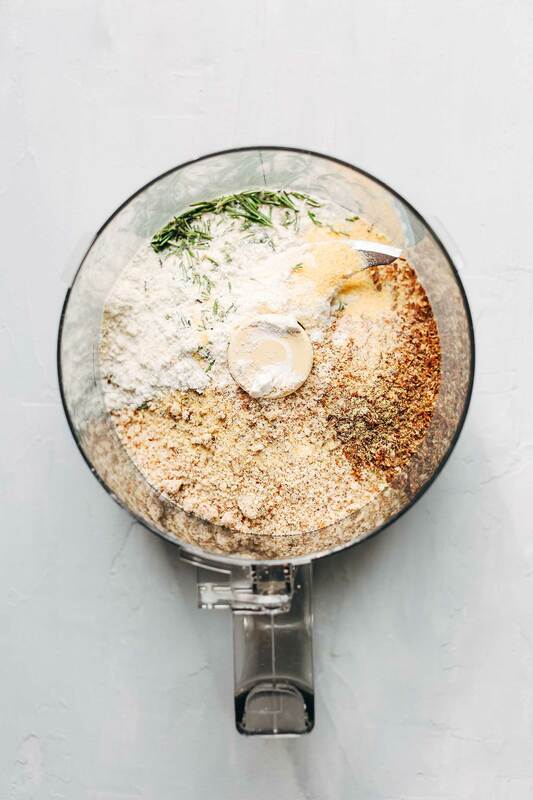 Add dry ingredients to a food processor or a mixing bowl and process or whisk until thoroughly combine. Then add oil and pulse/use a pastry cutter or fork until crumbly. Add cold water 1 Tbsp at a time, pulsing/stirring until it forms a semi-sticky dough that’s moldable with your hands and not crumbly. It shouldn’t need more than 5 Tbsp (amount as original recipe is written // adjust if altering batch size). Remove from processor or mixing bowl and form into a loose ball with your hands. Transfer to a clean surface lined with wax or parchment paper. Lay another sheet of parchment paper or wax paper on top and use a rolling pin to roll the dough out into a rectangle slightly less than 1/8th inch thick (see photo). Use a knife, a pizza cutter, or a small cookie cutter to cut the dough into squares (or circles). Makes about 60 squares (amount as original recipe is written // adjust if altering batch size). Transfer the dough (still on the wax paper or parchment) to a baking sheet and pop in the freezer for about 10 minutes to stiffen. This will help them firm up and become easier to transfer to the baking sheet. Once firm, use a spatula to carefully transfer the crackers to the parchment-lined baking sheet(s) in a single layer, making sure they aren’t touching to ensure even baking. Bake for 16-22 minutes or until slightly golden brown (be careful not to burn). Remove from oven and let cool. Enjoy immediately. Store leftovers covered at room temp for up to 1 week or in the freezer for 1 month. *You can try subbing other gluten-free flour blends, but I can't guarantee the results. Also, if not gluten-free, feel free to sub unbleached all-purpose flour, spelt flour, or whole-wheat pastry flour. *You can sub gluten-free oat flour for the almond meal, but I haven't tried it and can't guarantee the results. *If using almond meal leftover from making almond milk, I would suggest dispersing the meal on a parchment-lined baking sheet and baking at a low temperature (200 degrees F (93 C)) for 15-20 minutes or until dry and the texture of almond meal. *Recipe loosely adapted from my Vegan Cheez Its. Hi Dana, Made these crackers the other day and they’re almost all gone. They are filling the crunch craving I often get since going gluten free. I used a packaged GF flour blend and ground my own almonds to make the meal. I omitted the baking powder and used less oil (maybe only 1 1/2 T) and they were plenty moist since the almonds and flax add oiliness too. Have to watch carefully because the top sheet almost got burned. The other sheet underneath got shielded somewhat and didn’t burn. Anyway, I used lots of dried rosemary and love the flavor. I followed your technique except that I didn’t transfer the crackers off the parchment that I rolled them out on. That seemed too much work. I marked the squares and chilled the dough then baked them. They were easy to remove from the sheets afterward. I just slid the parchment off the sheet to cool on the counter. Thanks for the inspiration to try making my own crackers. I made this recipe today and it turned out fantastic. The only changes I made was using spelt flour instead of Gluten Free and dried Tuscan spices because I didn’t have garlic powder on hand and they still tasted delicious. I won’t be buying store bought crackers anymore as these were easy to make and much tastier. Thank you for the recipe. What herbs would you recommend to replace the rosemary? Also I don’t use black pepper. Thank you!! Rosemary is our favorite for this recipe, but we think it would also work with thyme or oregano. Hope that helps! If you give it a try, we would love to hear how it goes! Five star crackers, everyone loved them! Thank you! The is the 3rd time I am making these crackers and I used a gluten free flour both times (not the gluten free flour blend stated in the recipe because I dint have all those ingredients on hand) . This time I’ve used amaranth flour.But each time I’ve made them there is a sandy – ness in the mouth towards the end as though the flour has sand mixed. I haven’t tried them with almond/oat flour. Do you think that could be the reason? Yes, you shouldn’t be getting that texture if you follow the recipe, Pooja. Let us know if you try as the recipe directs! These were fabulous. So many gluten free flour mixes have so many starches in them they leave a gritty texture. Your flour blend is wonderful and I will use it for all my baking. I used fresh oregano in my batch. I’ll double or triple up next time. They’ll be my go to cracker from now on. Will now spend some time looking at your other recipes. Thanks for making this sudden gluten free journey more manageable. I made this for my christmas dinner party and they were a huge hit! It was my first time making savoury biscuits so I was a little worried but this recipe was perfect (and super easy!). Thank you so much!! Hi Dana, thanks for a fun and delicious recipe. It’s the first time I’ve ever attempted crackers but will definitely use this recipe again. I have made these a few times now and they are really good. If the dough is too wet, they come out soft. If it’s too dry, they are difficult to roll out. I use olive oil as the oil. One commenter says she lets the dough rest to get thinner crackers. This works for me! I let the dough rest 5 minutes, roll them out thin between 2 sheets of parchment paper, let the dough rest again, and then roll them thinner. Then pop them in the freezer as directed. After I’ve transferred them to a baking sheet, I top them with a sprinkling of coarse sea salt before baking. I’m making a double batch today as they are completely addictive! I plan to experiment with different spices and flavors once I get tired of rosemary-sea salt. Great recipe! Works every time. I always use whole wheat pastry flour and oats. I also add a table spoon of nutricional yeast for that extra cheese flavour. It’s magical. Is the 3.5 for the oil 3-1/2 or 3 to 5 like the water? It’s 3.5, like 3 1/2! OK, thanks! I wondered, because of other fractions being expressed as 1/4, 1/8. so good! I substituted thyme for the rosemary + added some parm cheese, and they came out delicious. What do you consider Gluten free flour blend? I am a recent gluten free patient and I am still learning, added to that I live in Jamaica and we all the flours independent , just haven’t come across a blend…..is this a recipe mix for this? Hi Patricia! You can find our gluten-free blend here! I substituted buckwheat flour for the almond meal. The biscuits filled the house with a lovely herby aroma and tasted delicious! Thank you! Yay! Thanks for sharing, Robyn! The All purpose flour recipe says that the xantnan gum is optional. Did you use it in your recipe? Yes I did. However in this recipe it’s not critical. Thank you for this recipe! I wanted to make it twice before I left a comment. First, they are delicious, and I usually hate gluten-free flavors. But necessity struck and now I must, so for the past two years I’ve been learning to make G-free food. In my attempts to make these crackers, I found that the water listed was not enough. Perhaps it was the flour I was using, but I just ended up with a bunch of crumbs both times. So I increased the water until the dough was pliable, and increased back time. Even like this, they came out just fine. I also found them to be a bit bland at first (I did not use brewer’s yeast), but did not want to add salt, since the lower-sodium is a good thing. I added more herbs from my garden (rosemary, thyme, sage, mint and chives), and then of course…. it turned the dough green :) but it didn’t change the baking at all. Bottom line, I realize that this recipe is a Very Good Basic recipe that can stand innovations according to the taste of each baker. I give it 5 stars!! Hi, Dana! I had tried quite a few “failproof” cracker recipes before and non of them came out nearly right. This was delicious and worked out perfectly first time around. And really straightforward. Had to leave a comment to say – Great recipe! And thanks for sharing! Glad to hear these worked out well for you, Fabi! Hi Dana, just thought it was worth sharing here that I have now also experimented using coconut pulp leftover from making coconut milk in place of the almond meal and it also worked really well! Crispy, with a hint of coconut flavour and easy to make! Thanks again for the recipe. Yum! Thanks for sharing, Fabi! Brilliant recipe. I have done these several times always works well. I use rice flour as gluten free, and added garlic powder and nutritional yeast. I skip step 7 ( freezing ). 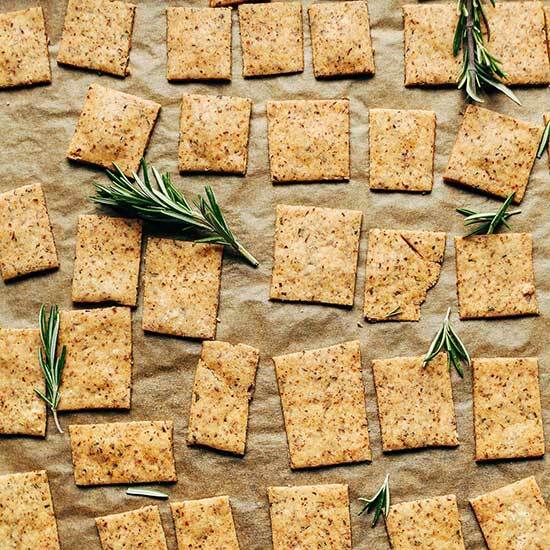 Also I removed the paper, then topped the cracker sheet with chia seeds and rosemary before cutting these, gave these another press with the paper so the added ingredients stick to the crackers and then cut these. Great! Thanks for sharing, Delphine! We haven’t tried making these with domato flour, but if you give it a try, report back on how it goes! This was the first time I made crackers and they were delicious! I used all whole wheat pastry flour. I appreciate how specific the directions were and I needed 5 tablespoons of water to get the correct consistency. Great recipe! They taste delicious, I was just wondering if it’s normal that the crackers aren’t very crunchy. Thanks! I have been baking gluten free for 18+ years. I followed this recipe to a tee and disappointed with the result. I ended up using 5 tablespoons of ice cold water yet my crackers were extremely dry and bland. Is there something you could suggest? I was really hoping these were going to work. Hi Dana, My son cannot have any oils at all- do you think this would work with just skipping it, or is there something I could substitute oil for? I feel like it would need the oil to firm or crisp up. I am assuming that I can use my almond flour rather than the meal? Didn’t see anyone ask that so I thought I’d check. I know the texture and moisture content would be a bit different between the almond flour and meal, so hoping it works. Thanks. Hi Mary! Yes, that should work! The whole batch was gone in one night. Guessing they were a hit! Is it possible to make these in a dehydrator instead of the oven to make them raw? I just made these for the second time and accidentally put too much water in; they were good anyway! They were better with less water (the first time), but not ruined with more. They took longer to bake with the extra water. I had about 20+ people try them and they ALL loved them! Made these with another gluten-free flour and they were GREAT! I will try again with different herbs. I am glad my first attempt at making crackers went well. Thanks! I made these with Bulk Barn 1-1 GFAPF mix and they were absolutely delish. I had them with a non dairy cream of asperagus soup. Wow…thank you so much for this recipe. I will adapt it to my own. I made it and Used oat flour. I found I had to use about 5 tbsp water. And they were/are delicious! Okay, I don’t subscribe to stuff. … That said, I notice in looking for recipes I keep ending up here. Really easy and fantastic vegan ideas…. delicious, too. Sign me up. I want more. THANKS!! Has anyone tried making with chickpea flour (in place of DIY flour) and nut butter (in place of oil)? Would love a heads up! ? Hi Nicole, Did you try it with nut butter? Did it work? YUM! I didn’t have flaxseed meal so I subbed chia seeds and used dried rosemary instead of fresh. These are delish and so easy!! I just got finished making these crackers. I love them! Think I made them a little too thick but still have a crunch. I sprinkled seas at over the tops as well. Love the flavors! Will definitely make again! 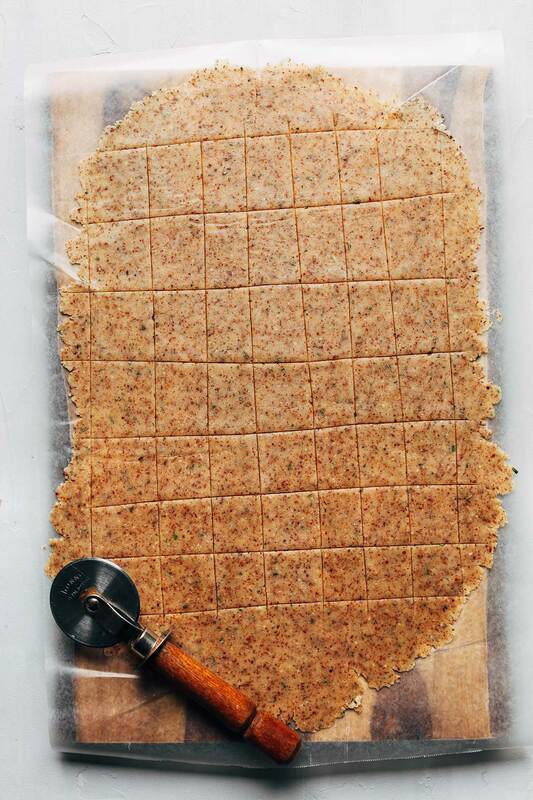 I have a question about the recipe for 1-Bowl Vegan Gluten-Free Crackers. What is the best way to process the fresh rosemary for this recipe? I grow lots of rosemary in my yard and would like to use more of it. Should it be ground fine or just minimally chopped. I noticed that the crackers seemed to have extra fine bits of it. I am concerned about grinding it so fine that it becomes mushy, because my rosemary is fresh and not dry like most of the store-bought variety. Hi! Just chop it finely and that will do! I substituted quinoa flour for the GF flour, and oat flour for the almond meal. I didn’t have flax seeds so I used ground chia seeds instead. The crackers turned out fantastic! This recipe really is quick and easy. I don’t know why I waited so long to make it. I make similar to these but I top them with various seeds. And my sweet option is with raisins or goji berries. i think i will try this recipe as it tastes very delicious and plus it is healthy as you only need to bake it. These look amazing. Love your site! Would you know if I could I use garbanzo flour instead of the DIY blend? Can I use buckwheat flour in place of gf mix? It’s worth a shot – let us know if you give it a try! I tried to figure out how to use buckwheat groats I had at home with my minimal knowledge of tasty recipes with such ingredient and tried your recipe with buckwheat flour. It makes up for less amount of crackers (circa 16) as the dough is quite thick. It would probably go better if I added more water :). It is probably as not as light as these from the GL mixture of rice flour but I liked it :). The rosemary and garlic were perfect choice. These were great! Rich and filling but healthy. I’m excited to add a cracker to my repertoire! Could you make this as a sweet cracker? Like a cinnamon-sugar cracker? Great idea! If you give it a try, report back on how it goes! These look so amazing! I’m always trying to find yummy things I can give my son without all of the added junk. I can’t wait to give these a try! I made them–added 2 tbsp of nutritional yeast and 1/2 tsp garlic (I didn’t see garlic on the ingredients list) and I didn’t freeze and they were superb! Thanks for sharing! I added the garlic powder – good catch! But it is optional. Yum! I made these crackers tonight…they were easy and taste great. One question though – at the beginning of the blog you say they are seasoned with garlic powder, but I don’t see that in the ingredient list. Should some be added with the dry ingredients? I am definitely trying this. What do you think of adding some veggie pulp leftover from juicing? Hmm, that might be too wet. But if you try it let me know! Just made these! I didn’t have fresh rosemary so I added a good dash of paprika and some chili powder to flavor them. Decided not to use the food processor, and used Bob’s Red Mill 1:1 GF flour (the non-chickpea kind), almond flour, and safflower oil. Baked for 20 minutes, and they’re delicious! Really crispy and hold together really well — will be great with dips. Thanks for the awesome recipe! Wow! Love this recipe Rachel! As a raw vegan I’m always looking for simple ways to create versions of my old time food faves in a healthy way or make twists to create vegan version for my hubby to enjoy and devour. He is going to love this recipe and I can create a raw vegan version for myself too ;-) I’ll let you know how it turns! Miam! Love this recipe Rachel! So simple!… I am always finding ways to create simple raw / vegan versions of my old food faves that my hubby can enjoy and devour! I don’t use oil ( at all ) what will happen if I leave the oil ( fat ) out ? I want to make these !!!! Please don’t eliminate oil from your cooking because you have been mislead to think it is bad for you. Not true at all. Bad oils are bad for us such as vegetable oils. They are inflammation producing in the body. Examples are corn, canola, cottonseed, Soybean, sunflower, safflower, corn, and palm oils. They are highly processed and deodorized and not healthy. Healthy fats are good for our body and our brain. Dr. Cate Shanahan has done a lot of research on this in case you want to look for more research. I wish you great health and happy cooking. These are excellent crackers with Avocado oil or olive oil. Healthy fats! I made these because I want to avoid gluten and processed fats from store bought crackers. Thank you for a great recipe!! Have been able to make these with a lower fat content? Or even oil free? That’s a good question. I wonder if something like nut butter might be able to bind, and then increase the water a little bit? I would add only about 1 tbs or even half! 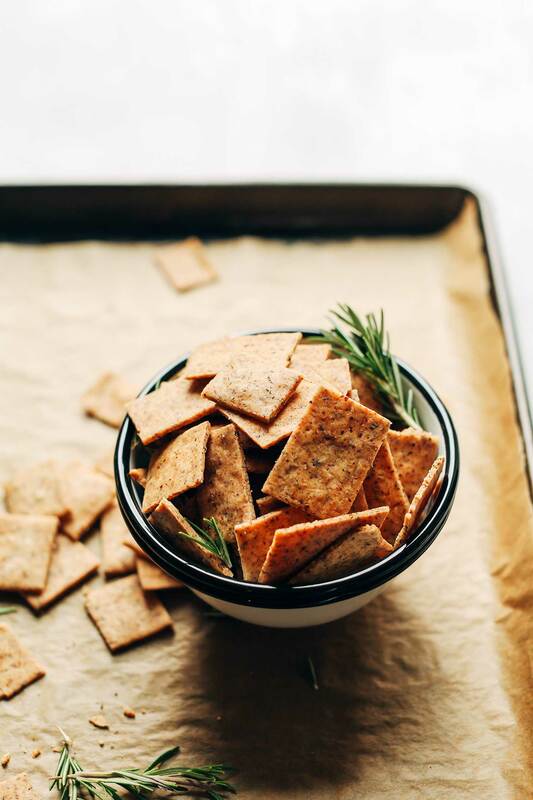 Brewers yeast is pretty bitter that’s why it’s usually put in sweet cookies(: although if your rosemary is very strong it will probably cover up the taste but these would be great lactation crackers! The flower, flax meal and brewers yeast is the triple threat! I made the regular cracker recipe just a few days ago and I made my own Almond milk for the first time as well yesterday from your recipe. Great stuff. Each day or once a week I try to incorporate healthier recipes into my meal planning. As well as purchasing items for my pantry to be able to create these meals which is a whole nother experience in cooking and preparing meals. Your blog is usually my go to blog to find wonderful creative healthful meal planning recipes. Stop! Too many must-try recipes from this site already. Note to self to throw some togarashi and seaweed mix in for a fusion cracker. Can I use garbanzo bean flour? It’s worth a shot! Let me know if you try it out. Oops, should have seen the notes. The answer is yes. But still curious if you think this would work with other nuts…. Can I sub AP flour? I really would like to make these!<-Busy teachers need their food! Never mind, it seems you already stated I can. Thank you! why would you do that? AP flour would be so bland, not to mention seriously not healthy . This recipe is delicious as is!